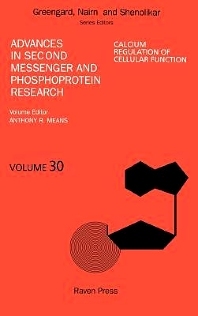 Volume 30 examines the prominent role of calcium as an intracellular second messenger. Leading investigators review a wide variety of studies on how calcium enters and moves through cells, how it interacts with its many binding proteins, and how calcium and its intracellular receptor, calmodulin, control vital cellular processes. Coverage includes a detailed analysis of the mechanisms by which calcium bound to calmodulin regulates contractile proteins in smooth muscle cells. Close attention is given to the roles of calcium and calmodulin-dependent protein kinases and phosphatases in synaptic signal transduction, protein synthesis, gene expression, programmed cell death, activation of T-lymphocytes, and control of cell division cycles. Other chapters discuss studies using genetically manipulable nonmammalian organisms to further proble the functions of calcium and calmodulin. Angus C. Nairn is currently Associate Professor at The Rockefeller University. He has published a large number of papers concerned with the structure and regulation of protein kinases and phosphatases involved in signal transduction, particularly with respect to signalling by calcium. Laboratory of Molecular and Cellular Neuroscience, Rockefeller University, New York, U.S.A.